Over the last several months, there have been a number of stories in the popular press about individuals who have to walk extraordinary distances in major American cities because they cannot afford a car. Detroiter James Robertson’s story, which appeared in February 2015, was the first and most prominent. A decade ago, Robertson’s 1988 Honda Accord died. Unable to afford repairs, Robertson, who lives in Detroit, walked 21 miles round trip every day, Monday through Friday, to reach his factory job in the suburb of Rochester Hills. That is nearly half the total distance of his commute. The other half was covered by buses. Robertson’s story went viral, circulating first within local and regional news sites and later to the national news and social media. Much of this coverage focused on Robertson’s hard work ethic and dedication to his work–unarguably admirable qualities. Robertson, who works as an injection moulder at the Schain Mold factory, has a perfect attendance record at work–trudging through the wide range of Michigan weather conditions (including the extreme cold that had descended on the region at the time of the story) to make his 2-10PM shift that pays $10.55 an hour. As one Detroit Free Press article highlighted, $10.55/hour is above the Michigan minimum wage ($8.15/hr), but was still not enough to afford car maintenance and insurance. This would undoubtedly be a difficult financial feat anywhere. But no-fault insurance requirements in the state of Michigan result in much higher insurance premiums that its neighboring states, and the high incidence of theft and vandalism in the city makes Detroit’s auto insurance rates the highest-in-the-nation, an irony not lost on inhabitants of the “Motor City”. As many commentators pointed out, James Robertson’s plight reflects poorly not on the hard-working Detroit resident but rather on a broader economic and social system that does not even meet basic living standards. His story clearly tugged on the heart strings of residents, who sought to alleviate some of the difficulty of Robertson’s living conditions. A computer science student at Wayne State University set up a Go Fund Me site for Robertson, and collected more than $350,000 from some 14,000 donors. Several local car dealers offered to donate vehicles, including the $35,000 Ford Taurus he ultimately received. A UBS vice president who had befriended Robertson arranged for financial services and placed a tracking device on his vehicle in case it was stolen. Local police have been working to ensure his safety after various relatives, friends, and neighbors sought to take advantage of Robertson’s good fortune. Robertson moved out of his old neighborhood and into a new apartment, surrounded by new friends as well as his dedicated and caring co-workers. His life is appreciably easier and more comfortable. He no longer faces the same health and financial concerns. He now gets a full 7-hours of sleep (as opposed to the 2 hours he was able to get before), and his commute is cut down from 4 hours to 20 minutes. This is all excellent news for Robertson. But Robertson’s story also raised a number of broader questions about mobility and access that, if acknowledged, often went unaddressed in the news stories and social media posts occasioned by his story. In other words, giving Robertson a car and putting him on firmer financial footing does not address the conditions that created Robertson’s extreme situation. And, as was indicated in stories of equally extraordinary commutes that appeared in the months following Robertson’s, he is also not alone. Those who live and work in metro Detroit are well aware of the strain that limited public transportation places on city residents. Many buses only run once an hour, even within the city itself. 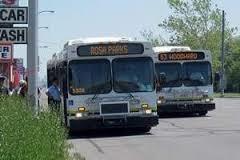 Unreliable bus schedules often mean that trips that require a bus change take as many as two hours or more. And within suburban communities, bus service can be spotty at best. Communities like Rochester Hills opted out of the millage that would extend SMART bus services into their communities, making commutes even longer and more difficult for people like Robertson. Robertson is certainly not alone. University students, workers, and residents throughout the metro area struggle to move within the sprawling metropolitan region, which was built alongside the growth of automobile technologies and cultures, but which has since faced a severely declining population and tax base that leaves it unable to provide sufficient public services to all urban residents. The most obvious issue raised by Robertson’s story, then, is one of public transportation and spatial planning. As development boosters, urban planners, and activists trumpet a resurgent Detroit, residents have begun to question what this revived city might look like. Debates about “right-sizing” the city, extending light-rail along Woodward Avenue, removing blight, improving emergency response times, and connecting city and suburb have dominated conversation about Detroit’s future. All of this speaks to Robertson’s experience. The debates are significant ones, particularly for a city that arguably pioneered suburban sprawl and now is facing the painful consequences of retraction. And the attention that Robertson’s story received highlights both superficial do-goodism and real concern about who benefits and who is left out of these new developments. However, at the root of all of this is an unacknowledged faith in the power of automobility. Rather than using Robertson’s situation to call for improved public transportation, well-intentioned donors helped him purchase a car. If the culture of automobility had been inaccessible to Robertson, the solution was to provide him with the means of access. Problem solved. His access to a vehicle and his sudden financial security were a realization of the American dream–an idea intimately connected to the cultures and practices of automobility since the early 20th century. As Cotten Seiler has noted in his book Republic of Drivers, the development of automobile technology in the early part of the 20th century quickly became central to American identity. From the founding of the first automobile factory in 1895 through the development of the Interstate Highway System in 1961 and the suburban sprawl that followed, driving “evolved into a crucial symbol of freedom and agency.” Undoubtedly, as Seiler notes, the symbolic power of the automobile enabled otherwise marginalized groups like African Americans and women to make claims on that American identity. 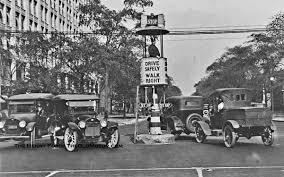 But the reliance on automobile technologies, and the associated road infrastructure, also left out large numbers of unacknowledged Americans. Can one be an American citizen without automobility? Sustainability advocates argue that you can, and urban planners and other experts have sought to redesign cities in ways that would minimize driving, increase accessibility to public transportation, and encourage bicycle and foot traffic–what one recent story about New York City called a “city underfoot.” A superficial glance at statistics might suggest that Detroit is well on its way. 26% of Detroit residents do not have access to a vehicle–a surprising figure in a city that was arguably built on and through the automobile. That ranks it 8th in the nation. But, in contrast to most cities ranked above Detroit, vehicle-less Detroit residents do not have reasonable alternatives. In other words, many of that 26% of Detroit residents are not choosing to live a car-free life. They simply can’t afford them. Yes, better public transportation and more efficient and compact spatial planning would undoubtedly make a car-free life more feasible. But it is unclear whether these projects will be successful if we continually fail to address the assumptions we make about automobility and its centrality to American identity. Far from democratizing access to mobility and autonomy, the story of James Robertson suggests that automobility has further exacerbated inequalities in income and access to resources in America’s largest cities, making it difficult for many people to survive, much less succeed. It behooves us to reinterrogate those assumptions, looking at alternative models of automobility, public transportation, and motor vehicle ownership. Ghana on the Go provides us with just such a model: a vibrant culture of automobility that is premised not on individual car ownership, but rather on commercial public transportation rooted in the practices and cultures of entrepreneurs rather than corporations or governments and responding to the interests of passengers rather than the dictates of planners. Entrepreneurial anarchism? Perhaps. And it certainly comes with its dangers and challenges–we must be careful not to idealize Ghanaian commercial drivers. But we also can’t assume that the cultures and values attached to American automobility accompanied the technology as it spread across the globe through trade networks. There is, in other words, nothing inherently American about automobility. Paying attention to those particularities helps us understand the culture of motor transportation in Ghana, but it might also help us think about the experiences of James Robertson in Detroit.